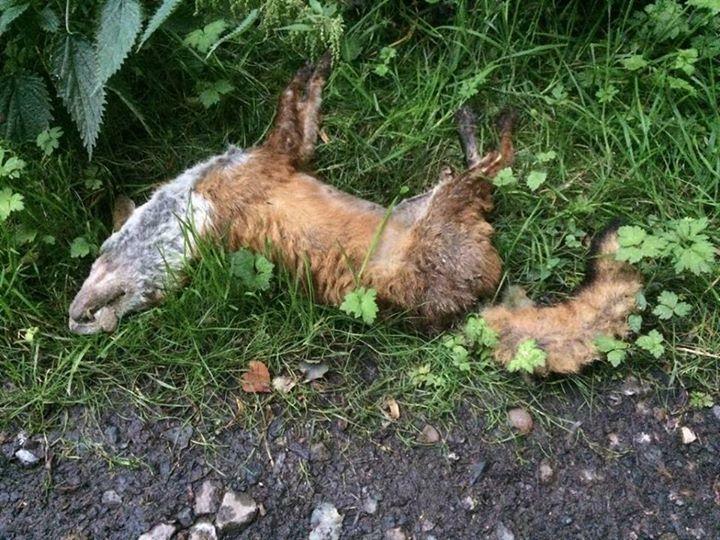 This was the dead fox found outside Mike Foster’s home. A DEAD fox has been found outside the drive of Worcester’s former Labour MP Mike Foster – just hours before a crunch vote on watering down the hunting ban was dramatically ditched. This image shows the scene outside Mr Foster’s home near Holt Heath at 8pm last night, with the carcass sprawled on the grass. Mr Foster, who represented Worcester for 13 years until 2010 and was the driving force behind banning hunting, has put it into a black bin bag and is planning to dispose of it today. The 52-year-old famously introduced a Private Member’s Bill in 1997 to ban fox hunting, the principles of which were later taken into the 2004 act. He said: “I genuinely don’t know what the cause of death was, it may have been a fluke that the dead fox ended up on my drive but it seems unusual. “I don’t buy into ‘it’s just a coincidence’ if I’m honest, but I don’t know. I’ve bagged it up and will dispose of it. It comes as the Government decided to postpone a Commons vote on relaxing the Fox Hunting Act planned for tomorrow, fearing defeat after the 56-strong SNP revealed it was siding with Labour. The SNP did originally say it would not vote on bills affecting just England, which would include the fox hunting debate, but changed its mind in a u-turn, with critics saying leader Nicola Sturgeon is trying to get back at the Prime Minister over the whole English votes for English-only laws saga. With the Government having a majority of just 12 and up to 50 Tories planning to go against David Cameron, the vote has now been scrapped until the matter of English votes for English-only laws can be settled. Your Worcester News can reveal how county MPs were prepared to back the Government in relaxing the act, which would have meant farmers and landowners could use as many hounds as they want to “flush out” foxes, instead of the current limit of just two. In recent weeks furious campaigners have slammed the move, saying it will be impossible to enforce such a law and making hunting in packs much more widespread. Worcester MP Robin Walker said: “I do appreciate people have strong views on this, both for and against but my position has been consistent – my inclination is to vote for the change. West Worcestershire MP Harriett Baldwin and Mid-Worcestershire’s Nigel Huddleston said they’d also back the change when it comes before parliament, but Wyre Forest’s Mark Garnier revealed he’s yet to make his mind up. Mrs Baldwin said today: “Hunting has always been a highly emotive issue and I have received extensive correspondence on this matter on both sides of the debate. She said “it seems sensible” to back the move as it would bring hunting law in England and Wales in line with Scotland. There are at least three major petitions urging MPs to keep the law as it is, signed by 650,000 people online. But Mr Cameron is a known critic of the original bill. Eighteen years ago Mr Foster used a poll in the Worcester News to launch his old Private Member’s Bill to try and end fox hunting, which did not become law but paved the way for the 2004 act. Here, in his own words, he revisits what happened back in the 1990s and urges today’s MPs to keep the bill intact. “Just over 18 years ago Worcester News readers overwhelmingly urged me, as the newly elected MP for Worcester, to ban hunting with dogs. “So began my long association with the issue. “Back in 1997 dogs could be legally used to hunt foxes, hares and deer. “In the name of sport, foxes and hares were chased until the point of exhaustion before the dogs caught the quarry and ripped it apart. “Back in 1997, 75 per cent of the public wanted to see hunting banned, including the readers of this newspaper. “So what changed? After a prolonged on-off debate, hunting was finally banned in 2004. “So what was the impact? Foxes have not overrun the countryside, there has not been the forecast slaughter of hunting dogs or horses, nor has there been mass unemployment amongst those employed in the sector. “Indeed, the pro hunt lobby go further. They claim that the ban means they now follow a scent rather than a live quarry and as a result hunting has never been so popular, with more riders and followers. “So my question is why go back? “David Cameron is seeking to amend the Hunting Act to render it unenforceable. “If passed, these changes would allow a pack of dogs to hunt a fox for the purpose of ‘research or observation’. “It is a nonsense designed to bring the Act into disrepute.